With this blog post, we will compare an ACH transfer with a wire transfer and explain how expedited ACH transfers are more risky. How Long Does an ACH Transfer Take? A standard ACH transfer can take up to five business days through the Dwolla Platform before the funds are made available. To expedite ACH transfer times, Dwolla has introduced innovations such as next day and same day ACH into its platform. A few reasons explain why it takes up to five days before funds are made available through the Dwolla Platform. 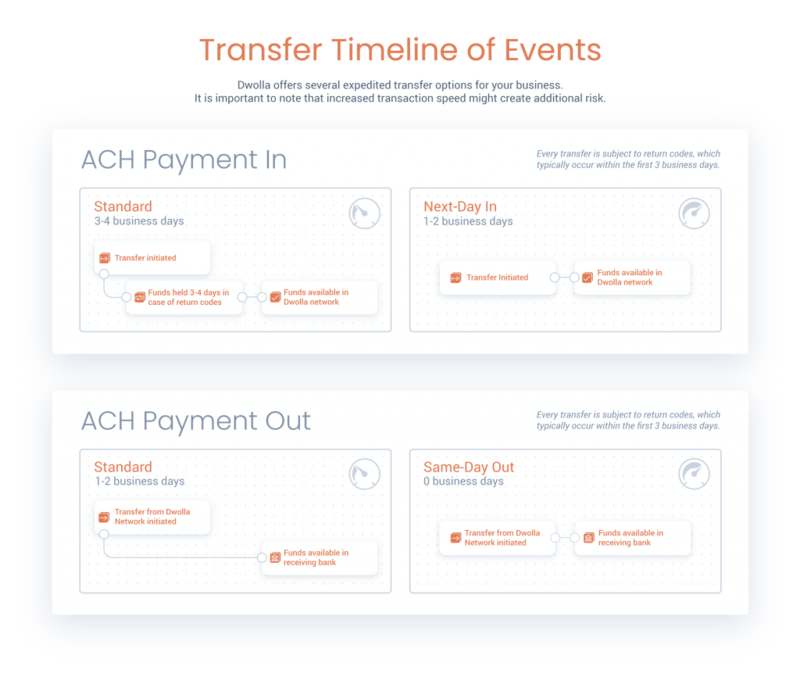 The ACH network needs only one day to settle a standard transfer, but Dwolla delays transactions for three business days to receive any potential ACH return codes. Because an ACH transfer is based on the assumption of good funds and correct data between financial institutions. When payment information is incorrect—for whatever reason—or the funds weren’t available from the sender, a bank can issue a Notification Of Change (“NOC”) or one of the nearly 80 ACH return codes. But using next day and same day ACH, multiple “windows” are available for providers or financial institutions to send ACH batch files (credit card payments, utility bills, etc.). These additional windows speed up the transfer time and allow payments to be processed in one or the same business day. Using same day ACH allows for ACH transfers to be processed on the same business day; all other ACH transfers settle on the next business day. Funds just aren’t always made available until the holding period is completed, which can be up to three days to wait for a potential ACH return code. But as transaction times speed up, so does the amount of risk involved in each transaction. To differentiate themselves, businesses are leveraging same day or next day ACH as a way to bolster their competitive advantage. But with faster transfer times comes higher levels of risk. Any account transferring funds using same day or next day ACH could receive a return code even after the funds have settled. That’s because the Receiving Depository Financial Institution (RDFI) has 48 hours to issue most return codes. Most return codes are received by Dwolla on the third day after the transfer has been initiated, so the safe practice is to hold funds as pending until that third day. With next day ACH entries, Dwolla will not automatically hold them as pending. Dwolla will process on the day after they export. So return codes such as R01 (insufficient funds) or R04 (invalid account number) can still come in after the funds have been marked processed. Depending on where the funds are, the ACH entry and the connected transactions can be marked as “failed.” Those funds are then subtracted from the balance of the account in which they were held. If the funds are already withdrawn or moved to another account with an unrelated transaction, then the account balance becomes negative. Once an account becomes negative, the customer needs to contact support@dwolla.com. ACH transfer and wire transfer…one in the same? While a wire transfer and ACH transfer seem similar, they are not the same thing. A wire transfer is usually a direct bank-to-bank transaction. Because of the automated clearing house, each batch of ACH transactions are handled by the clearing house. The most significant difference between wire and ACH is that funds sent through wire transfers are guaranteed to the recipient right away; Funds sent via ACH are not guaranteed and can be returned (which is why they are held depending on the risk factors of each transaction). But wire transfers typically come with a fee where ACH transfers are more cost effective. For a deeper dive into the components of an ACH transaction and the timeline, read this blog. The chance of fraud or a data breach always exists with online payments but there are numerous ways to secure your payments. At Dwolla, we help manage the complexities of payments with proven security practices, as demonstrated by our SOC 2 Report. We’re constantly taking the necessary and appropriate steps to protect the platform and our customer data. We tokenize high-value data in the financial transaction and partner with industry leaders to help protect your identity and your money. Dwolla is able to recognize adversaries bad behavior such as fraud or security. With our in-house analyst team we can act on those insights. Dwolla focuses on ACH transfers, allowing businesses to focus on what they do best.